The M.F.A. in Production Design is an intensive hands-on two-year program designed to equip production designers with the latest conceptual and practical skills needed to succeed and thrive as professional designers in the film and television industry. The program encourages designers to discover their own conceptual approach to design for film while collaborating with fellow production and visual effects specialists in the realization of short movies with high production values. In the first year, you will design two films in collaboration with fellow M.F.A. producers, directors, and cinematographers, creating your designs into reality on sound stages and out on location, and learning to work within budgets. In addition, you will also be taking a full curriculum of classes in production design: Traditional Cinema Set Design, Digital Design, Set Decoration, Illustration/Storyboarding and Graphic Design for Film. In your second year, you will design two thesis level films, again in collaboration with students from the graduate film production program. These two films are more advanced productions with larger budgets and more extensive shooting schedules than the films designed in the first year. There is also a full curriculum of production design classes in the second year: Costume Design, Design for Visual Effects, and Advanced Set Design and Digital Design. Applicants to the program typically have an undergraduate degree in Design or Art. Theatrical design, architecture, interior/environmental design, film production, or fine art; although, the student who has an undergraduate degree in literature, art history, or other similar disciplines in the humanities should not be dissuaded from applying. Production design in its essence is a visual interpretation of dramatic literature. Drawing and design skills are paramount to sophisticated development of film design, but fundamentally what we do is develop a story, so knowledge of culture and sophistication of story structure is central to the design process. Articulate the role of the production designer and the design team in film and television, in relation to other key creative participants on a professional production. Through closely mentored presentations and projects, develop and demonstrate an understanding of how multiple disciplines are combined to inform the production design process. Be able to apply the practical and technological tools necessary to conceptualize and present design ideas in a professional setting. 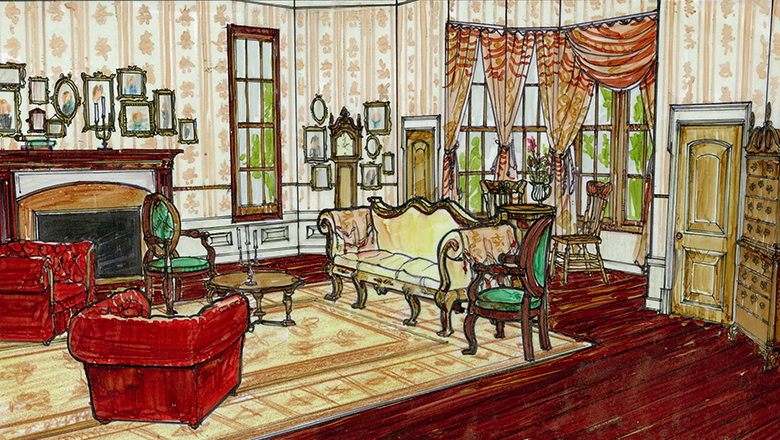 Demonstrate an in- depth knowledge of the business of production design. Complete 57 credits at the 500 or 600 level. Successfully complete the thesis project. In order to apply to the Production Design graduate program, you must submit the required application materials, as well as a Creative Supplement. The application will go live in July, and more instructions on the application process will be updated on our website soon.